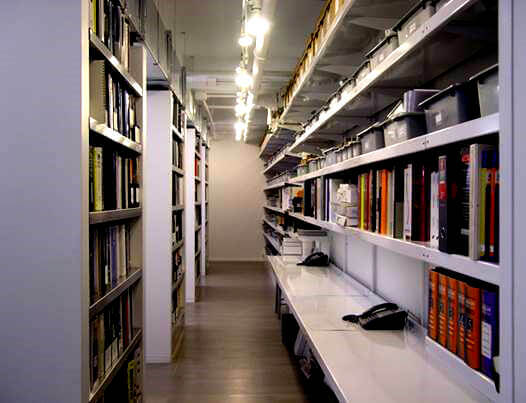 Architect Library Shelving by E-Z Shelving Systems, Inc.
Shelving for designers’ and architects’ libraries is one of E-Z’s most popular office applications. You can get the finish your want, and exact shelf dimensions you need, for a strong, clean-looking presentation of your heavy design tomes. A great way to request a quote for your library shelving is using the quote form below, but feel free to contact us with any questions at (800) 353-1331. 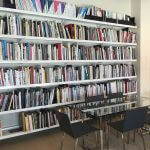 Use E-Z Shelving to create a clean look across a long expanse. This configuration combines library shelving with media storage and continuous desktop.